Deep wave, one of the hottest textures selling on our store. It adds length, fullness and volume to girls' own hair. The deep wave virgin hair weave is made of 100% real Malaysian virgin hair, which is cut from the same donor. We have #1b, Medium Brown and N Dark Brown for this weave, there will always be one size to perfectly blend with your hair. Now, choose the right type of extensions here and get a beautiful hairstyle for the coming season. The hair texture could accept any process just like your natural hair, you can straighten and dye it into any color you desire. The curl patterns is very relaxed especially the hair becomes wet. 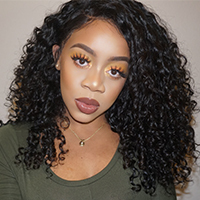 This deep wave hair gives you a full and thick look, the natural curl pattern could keep its original state for a long time. The color ranges from #1B, Medium Brown to N Dark Brown, it can be bleached into #613 color, the textured curls feel very soft, no tangling and shedding, the hair has a long life time that could last almost two years. Love the hair Review by Lisa C.
The hair was awesome, worked really well and maintained the style, a perfect blend with my natural black hair. great hair Review by Sasa B. Great quality hair and satisfied with the shipment, only took 3 days.